Let's kick off this week in a Chinoiserie-wallpaper-induced fantasy by looking at these spaces, all featuring Brunschwig & Fils' Lhasa wallpaper. 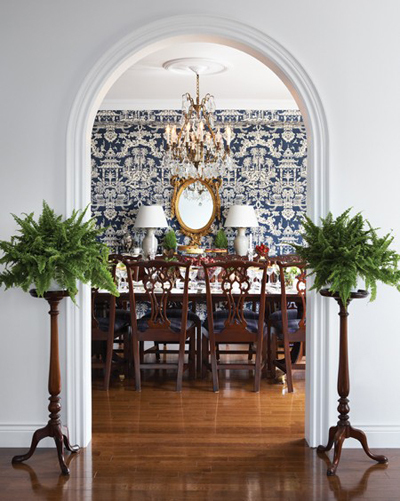 What a spectacular wallpaper used in three amazing spaces in very different ways. Which one is your favorite? The serene is lovely ! Probably edgy and eclectic, though I don't think I would have had the guts to wallpaper the ceiling. Love this wall paper. My fav is the dinning room.